The new Mercedes C class will arrive at the end of next month in Chinese dealerships. 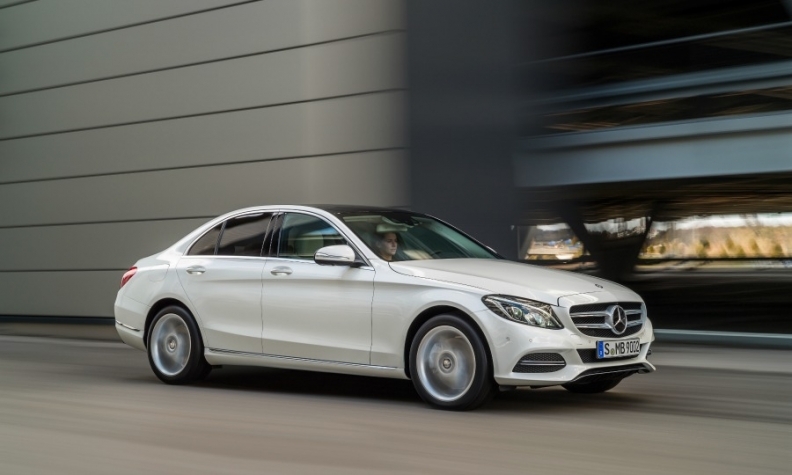 SHANGHAI (Bloomberg) -- Mercedes-Benz expects to outpace the growth in industry sales of premium autos in China this year, after merging two competing sales networks and adding new models including its new C-class sedan. The automaker is confident that it will grow faster this year than the 17 percent to 18 percent pace for China's luxury segment, Nicholas Speeks, the head of Mercedes in China, said today. Deliveries will probably exceed 300,000 units next year, with sales this year reaching about 250,000, Speeks said. Last year, the brand sold 218,045 vehicles in China, a rise of 11 percent over 2012. Sales have picked up after parent Daimler restructured the unit's operations in China, where it trails the BMW and Audi brands. An earlier decision by the company to maintain separate sales organizations for locally made vehicles and imported cars pitted Mercedes models against one another and resulted in price cuts. "It's the one significant factor that has enabled us to do far more things, far more quickly," Speeks told reporters in Shanghai, where the company opened its largest passenger-car dealer training center in the world. "We're cognizant of the fact that our competitors are growing also strongly from a much higher base. Therefore, we need to still put our foot on the pedal and gear up." The company recently announced a new after-sales service program, where customers can save as much as 20 percent for the cost of getting their cars serviced, Speeks said. Separately, he said Mercedes has "an ongoing conversation" with China's National Development and Reform Commission but isn't aware if the company is under investigation by the government. He didn't elaborate on the nature of the talks. The Chinese authorities are examining whether foreign automakers are preventing component makers from selling spare parts to any dealers besides those authorized by the car companies, people familiar with the matter told Bloomberg News last week. Daimler expects China to be its largest market as soon as next year. Mercedes is opening 100 new dealers in the country this year, taking its total to about 440 outlets in 200 cities by the end of the year, Speeks said. The company introduced the CLA compact and variants of the S class this year, while the new C class will arrive at the end of next month, with the GLA compact SUV slated for production in China next year, Speeks added. The company's 120 million yuan ($19 million) passenger-car training center in Shanghai, its fifth in China, will drill dealers in sales, management and technical programs.